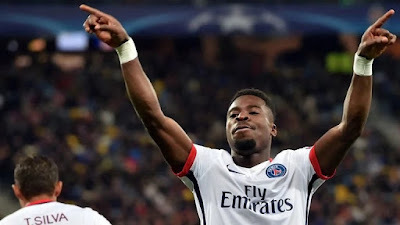 Chelsea who are the reigning Premier League champions have reportedly contacted French club Paris Saint Germain over the availability of star defender Serge Aurier. The Blues handler Antonio Conte is said to be seriously interested in the 24-year-old defender and wants him at Stamford Bridge this summer. Serge Aurier is also reported to have signified his intention to leave the French giants following the signing of Brazilian defender Dani Alves from Juventus. Alves is expected to make his way straight to the PSG starting 11, and Serge Aurier is not comfortable to become second fiddle to the Brazilian. Aurier is currently banned of entering the United Kingdom after assaulting a police officer, but he has appealed and Chelsea are ready in helping him for the ban to be lifted. His ban also made it difficult for him to feature for his club against Premier League club Arsenal in the UEFA Champions League last two seasons. The Blues will now face serious competition from Premier League rivals Manchester United who are also interested in luring the player to Old Trafford this summer. Manchester United coach Jose Mourinho wants Serge Aurier to compete with the right back position with Antonio Valencia at Old Trafford. Valencia has been in great form since he was converted to the right back position, but Jose Mourinho still wants a competition for the position.